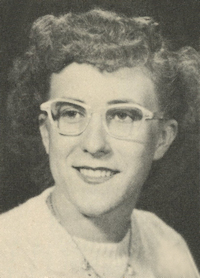 Obituary – Workman, Pat Ruth (Pricer) « Perry High School Alumni Association, Inc.
Patricia “Patsy” Workman, 68, Perry, died Sunday, Nov. 19, 2000, at the Mercy Health Center in Oklahoma City. Services are scheduled for 10 a.m. Wednesday at the First Baptist Church in Perry. Interment will be at the Grace Hill Cemetery. Rev. Buddy Hunt will officiate. Funeral arrangements are under the direction Brown-Sisson Funeral Home. Workman was born on June 28, 1932, in Perry to John J. and Cora (Kasl) Pricer. She graduated from Perry High School in 1950. She married Bill Dean Workman Sept. 27, 1952, in Oklahoma City. Workman was a housewife and had been a child care provider for 43 years. She was a member of the First Baptist Church of Perry and the Perry Elks Lodge. She is preceded in death by her parents, one daughter, Debi, seven brothers, and four sisters. Workman is survived by her husband Bill of the home; four sons, Mark Workman and wife Rhonda, Woodward; Mike Workman and wife Guyla, Perry; Marvin Workman and wife Paula, Perry; Rob and wife Karen Cockrum, Milford, Mass. ; three daughters, Pam Workman and very dear and special friend Tonya Reynolds, Oklahoma City; Rita Groom and husband Duane, Perry; Bev Dunn and husband Jerry, Perry; brother, John J. Junior “Jake” Pricer, Enid; sister, Norma Lee Stanford, Stillwater; three sisters-in-law; six granddaughters, 11 grandsons, 2 great-granddaughters; numerous nieces and nephews. Memorials can be made the American Diabetes Association.